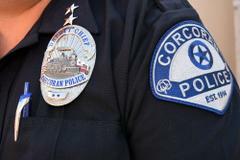 Over the next several weeks you will see Corcoran Police Officers begin to transition to a new badge and patch design. Our patch is a variation of the earliest shoulder patch worn. Prominent in our new badge design is a train. The artwork is based on a train that actually travelled the tracks through Corcoran in the early years. Corcoran was a “whistle stop” before it was a town and we believe the badge represents that historical significance. We are excited with the change and will wear and display them proudly.